Prolific cartoonist Peter Arno composed this cover for The New Yorker to celebrate the reopening of the 1939 New York World’s Fair in 1940. The drawing depicts attendants, hosts, and representatives looking towards the fairground’s entrance in anticipation of large crowds. With the looming threat of World War II, the 1940 season of the 1939 New York World’s changed themes from “The World of Tomorrow” to “For Peace and Freedom.” The presence of different flags suggests the international nature of such an event and also emphasizes American optimism in the face of global uncertainty. This exuberance can be seen in the faces of vendors as well, but one wonders if this demonstration is perhaps more in line with Arno’s and the New Yorker’s sardonic approach. For him, the New Yorker was a platform for cartoons, which had a capacity to poke fun at daily life and create believable and integrated scenarios. Producing over a hundred covers and even more captioned cartoons for the magazine, Arno was instrumental in setting a precedent for the publication’s now characteristically biting yet nuanced irony. His artful designs often lampooned the attitudes, prejudices, and humor of the New Yorker’s educated and affluent audience. Arno’s covers published between the 1930s and 50s solidified the cartoonist’s place in design history by pushing the limits of technique to tell outrageous stories. Michael Maslin, “Arno and the Fair,” Michael Maslin , accessed December 09, 2015, http://michaelmaslin.com/index.php?mact=News,cntnt01,detail,0&cntnt01articleid=324&cntnt01returnid=15. Robert Mankoff, “Happy Birthday, Peter Arno – The New Yorker,” The New Yorker, January 08, 2013, acc. December 09, 2015, http://www.newyorker.com/cartoons/bob-mankoff/happy-birthday-peter-arno. Peter Arno, Ladies & Gentlemen (New York: Simon and Schuster, 1951), 2. Françoise Mouly, Les Dessous Du New Yorker (Paris: Édition De La Martinière, 2012), 8. 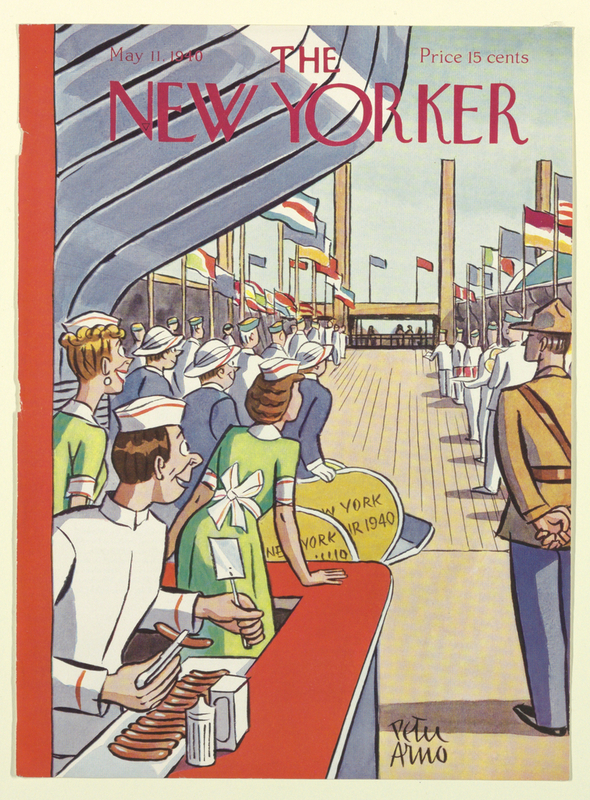 Print, Cover of The New Yorker, May 11, 1940: The New York World's Fair, 1940. colored ink printed on paper. Gift of Anonymous Donor. 1960-207-20.